The Dallas Cowboys, one of the most iconic and popular teams in the National Football League, has had the most playoff appearances to its name with 33. The team has made it to the Super Bowl eight times, winning five of those championship games. However, since the start of the new millennium another team, the New England Patriots, have been much more successful. As of the year 2000 the Patriots have made the playoffs 16 times, winning the NFL championship game Super Bowl six times. The origins of the NFL date back to 1920 when the American Professional Football Association was formed as a pro football league. The league renamed itself to the NFL two years later and the first playoff game was in 1933. Since then the league has played out its postseason in a single game elimination tournament. In its current format six out of the 32 teams in the NFL qualify for the playoffs each season. 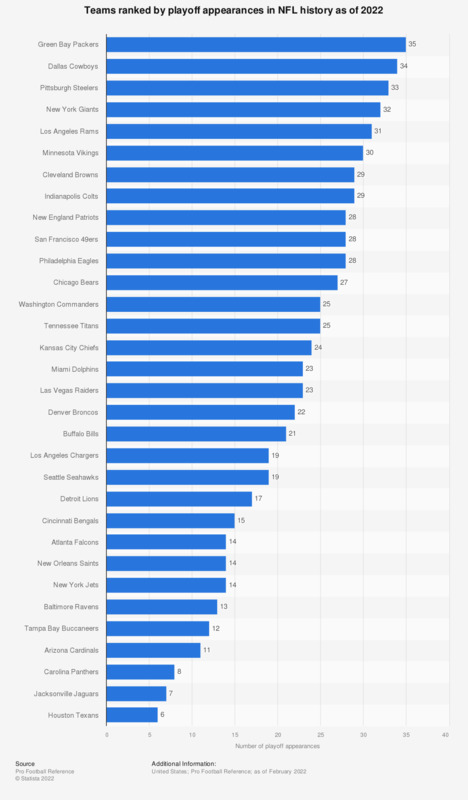 Even though the New England Patriots have made the playoffs ‘only’ 26 times, the team is the most successful in the National Football League in many ways. The Patriots have won the most playoff games of all-time (37), they own the highest playoff winning percentage and have won the most Super Bowls with six (tied with the Pittsburgh Steelers). Most of this success has come over the past 20 years under the guidance of head coach Bill Belichick and with the all-time great Tom Brady as quarterback.